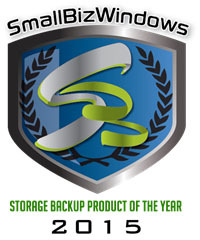 The SmallBizWindows Storage Backup Product of the Year 2015 is the HP RDX. Prior to my introduction to RDX by HP’s Calvin Walker, my faith in backups resided solely in tape. That hasn’t changed. Especially for larger backup jobs that require automated tape libraries. However, the utility of RDX is apparent from the instant you think about it. Fully integrated with Windows Server, and with cartridges that range from 320 GB to 2TB in capacity, RDX brings fast USB 3.0 hard drive speeds to SMB server backups, with rates approaching 360 GB per hour. With the simple drag-and-drop UI, and compatibility with most CDP (Continuous Data Protection) backup solutions, RDX comes in portable, shock-proof, and static-proof cartridges that are durable, yet interchangeable with all HP RDX docking stations, future-proofing your investment in the platform. A free HP CDP application is included in the package. This is a full-featured program, allowing for scheduling backup tasks while running automatically in the background. RDX is also smart, disallowing the removal of cartridges whilst backups are scheduled, or running. It is rated for 5,000+ load/unload insertions. HP RDX is available in internal or external models. A rack mount model is also available. Finally, this rugged solution is very cost efficient. This, without a doubt, is the premiere SMB backup and CDP solution on the market today. That is why it's also a winner of the SmallBizWindows Absolute Best Award.